SubScribe: Sexist? Fattist? Maybe. 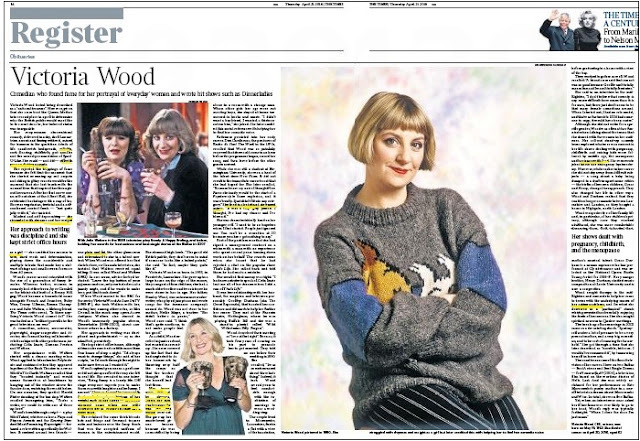 But how many people read that Victoria Wood obit before condemning it? Sexist? Fattist? Maybe. But how many people read that Victoria Wood obit before condemning it? How often do you "like" a link posted by a Facebook friend without reading the article they're sharing - or even clicking on the link? Never? Ocasionally? Daily? Almost always? We all do it. No one has the time to follow every link that turns up in their timeline, and pressing the "like" button is often no more than a courtesy, It's a way of acknowledging and reinforcing your relationship with the sharer, an endorsement of their general view of life, rather than a critique of whatever it was that moved them. What about commenting? Most of us are a bit more cautious on this. You'd have to trust your friend's judgment implicitly to echo their opinion publicly without first checking what they were on about. And sharing? Somewhere between the two perhaps. The FB status update above turned up on my timeline last night. 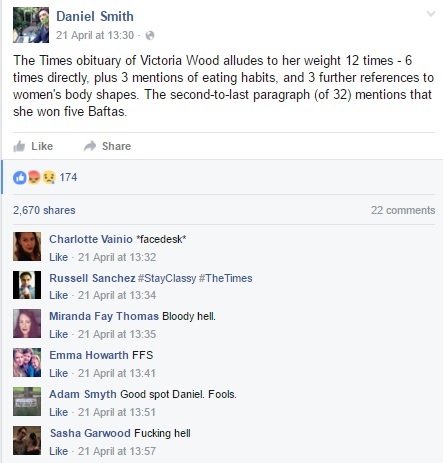 I don't know Daniel Smith, and we have no mutual FB friends, but it was widely shared and a real friend tagged me in a discussion on someone else's thread. As I write, it has been shared more than 2,900 times and attracted 248 emoticons. Smith's statistic also made it on to Twitter - although two of the sources for retweets have deleted their originals. Disgrace, shameful, outrageous, bloody newspapers! My own reaction was one of despair. First because of the substance of his comment, and second because I had just submitted an over-length magazine article about the treatment of women in the Press. That dealt mostly with the tabloids and I feared I was going to have to beg the editor to allow me an extra paragraph to say that serious papers could be just as culpable. Then I read the offending obit. Three times. 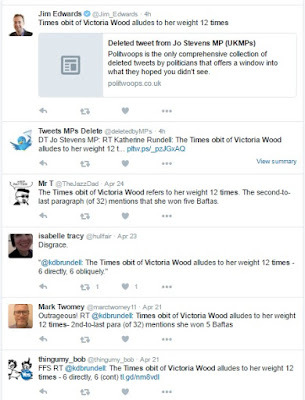 I found five paragraphs referring to Wood's weight and food issues, one description of a character she created as being "fat", and one quote from her about the British people not seeming to mind "if someone looks like a baked potato". I've now been through it six or seven times and am at a loss to find the full dozen - but then again, I was always hopeless at those "spot the difference" games in childhood puzzle books. Cellulite, pot noodles and dieting yoghurts all get an early mention - but in relation to her comedic material rather than to Wood personally. We learn that she ate tinned mince during a "grey period" and that she was vegetarian and teetotal, but these facts are not linked to her body shape. Modest and self-deprecating - she struggled with shyness and her weight as a girl - she credited her success to luck, hard work and determination, playing down the considerable and multiple talents that made her a stalwart of stage and small screen for more than 40 years. The eighth paragraph includes the description of her character Maureen in the award-winning TV play Talent as "plain and fat" compared with her "glamorous" friend Julie. Other obituaries describe Maureen as "frumpy"; the script stipulates that she is overweight. She was dogged by issues with food, and stung by criticisms of her weight early in her career - the worst moment came when one critic described her as "rolling on stage like a witty tank". This is followed by a par about her preference for trousers and trainers to fancy frocks and high heels and her baked potato comment. Her teens were marked by shyness, which she said was because she was fat and would over-eat. She lived in a bedsit and ate tinned mince. Her sell-out stand-up comedy tours exploited whatever was current in her life: shows dealing with pregnancy, childbirth and raising kids were followed by middle age, the menopause and her issues with food. She even wrote jokes about her emergency hysterectomy. Wood sought therapy in the mid-Eighties and onwards to help her come to terms with the underlying causes of her eating problems, and for what she described as a "puritanical" streak which prevented her from fully enjoying the fruits of her success. 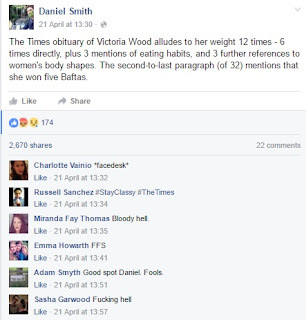 Daniel Smith is, in my opinion, right that there are too many references to Wood's weight and, yes, it's reassuring to know that some men notice these things. The first sub-clause is gratuitous, given that the subject will be tackled later on; the critic's "witty tank" comment should not have been given a first airing, let alone a regurgitation forty years later. But was it really as awful as Smith and his disciples think? Was there another, better, way? The job of a modern obituary writer is to try to get behind what made the subject the person they were, not just to list their works and awards. Victoria Wood's eating disorder clearly shaped both her mind and body - and provided her with comic material. It could not be ignored. Nor, indeed, could her onstage costume, any more than an obituary of Grayson Perry should avoid mention of his dresses and bonnets. It was a departure from the conventional and part of who she was. The Guardian described the Maureen character as "frumpy" and quotes Wood as saying that as a teenager she was "addicted to sugar, which makes you depressed". It also mentions therapy, but declines to elaborate on what the treatment was for, saying simply that she emerged "with a confidence that surprised those who suspected she was doomed to be awkward and vulnerable". It's a good obit, but in avoiding all mention of Wood's weight and its impact on her self-confidence it denies the reader a key insight. The Independent and Telegraph also mentioned the therapy, both saying that the reasons for it "were never specified". They must have read the same cuttings. The intro of the Telegraph piece describes Wood as a "plump chantreuse" and later asserts that she "cultivated a deliberately frumpy roly-poly image, attracting such epithets as the Daily Telegraph's 'plucky, buxom singing blonde from Lancashire'". It goes on to say that the teenage Wood was withdrawn, lazy and "tortured by low self-esteem". In that low period after New Faces she "stayed in bed for 14 hours at a stretch, eating too much" of that tinned mince. For years she had agonised about her weight, having envied her two older sisters who were thin and, to her mind, more attractive. As a young woman of 15 stone, she suffered from a compulsive eating disorder which she overcame and later incorporated into her stage act. This is interesting. It is brutal, but it gets right to the point, dealing with cause, effect and ultimate outcome succinctly rather than meandering around the issue as the Times does. Wood suffered from low self-esteem and later talked about being shy, lonely and overweight as a child. In the Nineties she had therapy relating to her past, though the specifics were never revealed. She also talked openly about her struggles with an eating disorder. This seems to me to be the best approach of the four. I had, of course, noticed that Wood was larger than most women who appear on television, but until I read the obits I had no idea of how big a deal it was for her. Like her, I have spent my life fighting with my bulk; it colours my every thought. A friend similarly tortured said today: "I hope that if I ever get an obituary, people write about how fat I was and how miserable it made me." 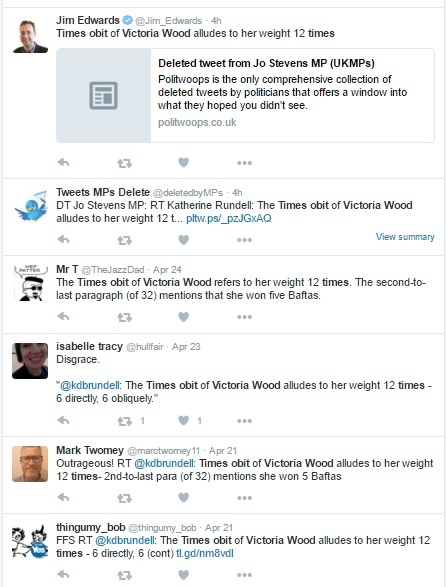 If there was an emphasis on her weight, surely that is because it was so important to Victoria Wood herself. Her body image is surely crucial to her development as a comic and how she overcame her insecurities by draw attention to them. Significantly the BBC Radio 4 obituary programme drew attention to exactly the same weight related anxieties. If height, size and weight is crucial to the genius of the obituary subject then it is perfectly acceptable to discuss these. Simply witness the many obituaries to the wonderful Ronnie Corbett. There were few indeed which did not mention at length, and then again some more, his short stature. He's not wrong there. The Times obit of Corbett included ten references to his height, including the fact that he bought his size four-and-a-half shoes from the children's department, that he was treated to a course called "How to stretch yourself" by a well-meaning aunt, that he was once the shortest commissioned officer in the British Forces, that he wrote a book called The Small Man's Guide to Life, and that he was honorary president of an organisation called the Five Foot Club, "which was formed to fight for a better deal for little people". Hmmm. Two wrongs or a fair comparison? The Times obituary editor is on holiday, so was unavailable to comment - but it would be surprising if next Saturday's Feedback column didn't offer some answers. Time constraints may be one (unsatisfactory) explanation: the version that appeared in the paper went up online at 8.04pm on the night Wood died. A much more polished version was posted on the website at 1am. The preoccupation with weight has been overcome to the extent that it is dealt with in a single paragraph three pars from the end. "Plain and fat" Maureen has gone. So, too, have the tinned mince and the baked potato. Of course it would be better had the original never appeared. The author and sub were both at fault. At least someone at London Bridge realised that it was inadequate - beyond the pale, even - and set about improving it. Hats off to whoever that was, though it's a pity the print version wasn't also updated. My initial question remains, however. Given that both web versions of the obit are behind The Times paywall, how many of those 2,900 sharers and tweeters read either?